I have had the pleasure of working for the association for a dozen years. I have worked for a United States senator, been chief of staff to a regional government, but this industry is something special. I am a workaholic — our past president Mark Bigej endured well over 2,000 emails over the course of a year, many of which were after 10 p.m. The nursery and greenhouse industry works even harder. It is who you are, and I could not be happier to work for you. The association has seen good times, followed by a deep and dark abyss, followed by a light out of that darkness. You are a story of keeping your focus, producing elite green goods, and rebounding to regain the top commodity spot in the state. The association is only as good as its members. It only thrives as long as our diverse businesses — large and small; growers, greenhouse and retail operators alike — join forces with allied suppliers to create a sense of community and place. The association spends a lot of time making sure that the business climate is as positive as it can be for the nursery industry. That takes many forms. Collaboration is king. We build relationships with state and federal agencies, especially those that are engaged in pest and disease issues, setting agricultural water quality standards, funding research, and operating programs that promote and protect every operation in the state. Last month, we coordinated a meeting with U.S. Rep. Suzanne Bonamici (D-Oregon) about trade. Also taking part were USDA Rural Development Director John Huffman, ODA Director Alexis Taylor, the OAN, Oregon Wine Growers Association and several business and technology companies. We talked about how we can promote agriculture’s important role in creating traded-sector employment. Also last month, we hosted a meeting between U.S. Rep. Kurt Schrader (D-Oregon) and several specialty crop producers to support efforts to obtain federal research dollars, infrastructure development funding and pest and disease program funding. We also work hard to defend against adverse regulation, both domestically and internationally. Two big examples come to mind. You might remember that after the big 2008 snowstorm that resulted in state and federal emergency declaration, the Oregon Department of Revenue had a proposal to tax every hoop house on nursery property ($2,000 per house). That did not happen because our association and volunteer leaders worked together to take the air out of this mind-numbingly bad policy. More recently, the USDA imposed a prenotification requirement for certain material due to an era of overreaction to pest and disease threats. Had it stood, this would have crippled the industry at a time when the recession was just beginning to recede. 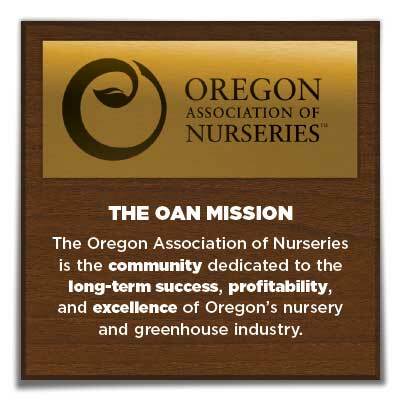 However, the OAN jumped in and helped USDA rewrite the regulation to treat Oregon growers fairly and recognize their investment in producing healthy plants. We are all about protecting our members against unnecessary regulations, promoting their green goods through the Nursery Guide (in print and online), helping people connect through the Farwest Show, and promoting and educating the industry through publications that are the gold standard in the industry. Digger goes to more than 7,500 subscribers, but it’s just the beginning. Whether you do wholesale, retail or both, our retail map and our wholesale nursery map guide customers to your door. Most of all, we want to support members where it counts — in the pocketbook. We look at everything we do, and if it doesn’t help you, we don’t do it. If you have a good year, we feel great. If you are facing challenges, we’re ready to listen and act. Pretty simple. The coming year will have no shortage of challenges and opportunities. 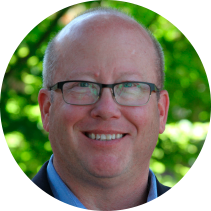 We are facing labor shortages, the uncertainty of international trade, changing consumer buying habits, the challenge of marketing products and the need to build a preference for Oregon growers and retailers. Your association engages on issues on many levels to help the industry. Your membership allows the association to be a strong voice on your behalf. I am grateful for the last dozen years of working for some of the best people I know. I’m looking forward to a profitable and successful new year!